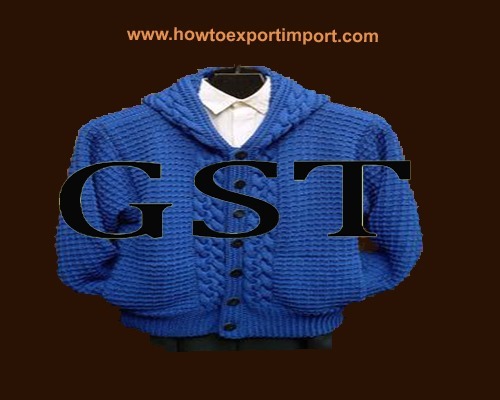 GST tariff on made up clothing, textiles, worn textiles etc. Made up textile articles, clothing and worn textiles and sets falls under HSN code chapter 63 of GST commodity tariff schedule. The details about GST rate changes for sale of made up textile articles, clothing and worn textiles, sets are being updated here. The notification changes on exemptions for GST for sale of made up textile articles, clothing and worn textiles, sets and other circulars related to GST for made up textile articles, clothing and worn textiles are updated in this website. 1. 6301 Blankets and travelling rugs. 2. 6302.10 Bed linen, Knitted or crocheted, Toilet linen and kitchen linen, of terry towelling or similar terry fabrics. 3. 6303 Curtains (including drapes) and interior blinds; curtain or bed valances. 5. 6305 Sacks and bags, of a kind used for the packing of goods. 6. 6306 Tarpaulins, awnings and sunblinds; tents; sails for boats, sailboards or landcraft; camping goods. 7. 6307 Other made up articles, including dress patterns; such as Floor-cloths, dishcloths, dusters and similar cleaning cloths, Life-jackets and Lifebelts, Sets consisting of woven fabric and yarn, whether or not with accessories, for making up into rugs, tapestries, embroidered table cloths or serviettes, or similar textile articles, put up in packings for retail sale. 8. 6309 Worn clothing and other worn articles. 9. 6310 Used or new rags, scrap twine, cordage, rope and cables and worn out articles of twine, cordage, rope or cables, of textile materials. 7. 6307 Other made up articles, including dress patterns; such as Floor-cloths, dishcloths, dusters and similar cleaning cloths, Life-jackets and Lifebelts, Sets consisting of woven fabric and yarn, whether or not with accessories, for making up into rugs, tapestries embroidered table cloths or serviettes, or similar textile articles, put up in packings for retail sale. In India, GST is payable for made up clothing, textiles, worn textiles etc. However, some of the categories of business under HSN code 63 are expected to be exempted from paying GST. The list of exempted categories of business and exempted products and services under GST is expected to be released soon. Rate of GST for woven fabrics of paper, Paper Yarn, other vegetable textile fibers etc. Difference between Indian GST and GST of other countries? What is the GST rate on Blankets? How much GST on bed linen? What is the GST tariff on Other Blankets? What is the GST rate on knitted Table Linen? How much GST on cotton Not Knitted Other Furnishing Articles? How much GST on other Bed Valances of Cotton? A jain: On 04 June 2017 How much import duty & GST chapter 6309 ? Mohit goyal : On 05 July 2017 What is the gst rate on mink blanket bedsheets and Pillow? harshal k: On 23 August 2017 what is the rate of gst for diamond rough and polished? IGST Act 2017 Sec 3, Appointment of officers.